A stack of notes required for statistics and economics classes. Kathia Benitez, director of sustainNU, said her office is working with faculty to reduce paper waste in classrooms. While Northwestern has been recognized for its efforts to be environmentally conscious on a broader scale of resource purchases, some students said sustainability in daily consumption can still be improved. Sustainability has been one of NU’s top strategic and community engagement priorities in the recent past, according to the sustainNU website. In 2018, the University was recognized at the Illinois Sustainability Awards, honored for its efforts to engage its student body in sustainable practices and increase its landfill diversion rate to 38 percent. However, some students said the broad overarching sustainability goals of Northwestern do not manifest themselves into the everyday practices of students and faculty on campus. McCormick first-year Nora Chambers said two of her four classes require printouts every week. 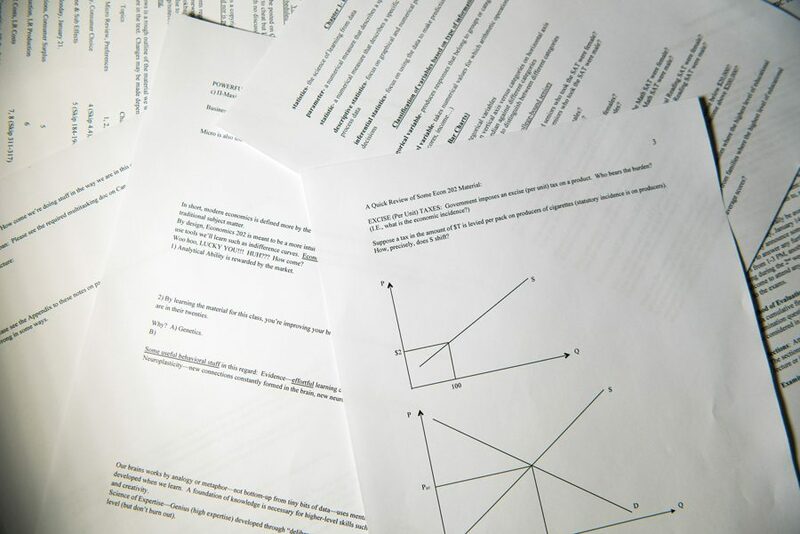 Some statistics and economics classes –– which are as large as 200 students — require students to print about 10 pages of notes each week. Over 10 weeks, this can add up to 20,000 pages of paper produced for one class, or 10,000 if double-sided. In such classes, professors claim the use of any digital devices can provide possible distractions. Yet Chambers said this reluctance toward technology use can prove to be environmentally unsustainable in the long run. For some students, paper in classrooms cannot be fully avoided. McCormick first-year Ahan Sahu said his Design Thinking and Communication sequence requires him to be able to draw directly on paper. Kathia Benitez, director of sustainNU, said she acknowledges the issue of excessive paper use on campus, which is why paper reduction is one of the office’s goals. While Associated Student Government is incentivizing students to promote more sustainable practices, Benitez said her office is trying to hold dialogues with faculty as well. “We want to reduce paper not just throughout administration but also want to keep a check on the kind of paper we’re buying, and that’s all part of the resource conservation plan,” Benitez said. The University can also improve sustainability beyond the classroom –– such as in dining halls and Norris restaurants –– said Communication sophomore Maggie Olson. The coffee cups in the dining halls and the plastic cutlery available in Norris cannot be recycled, she said, adding to the waste produced by NU.